Read the latest release notes here! With new features, enhancements, and bug fixes, DVD Profiler keeps getting better, and all current and future version updates are included in your one-time purchase. Read all about the latest version here. DVD Profiler's unique combination of desktop application and online data access sets it apart from competing alternatives. With an enormous community of dedicated users worldwide, DVD Profiler has become the most compelling source of DVD information anywhere. 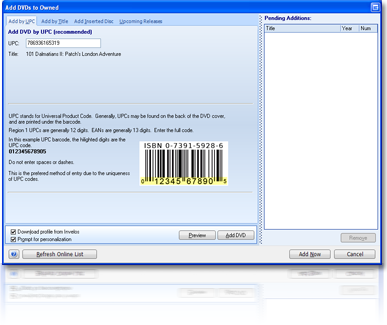 Some of the features here are part of Unlimited Registration. For a complete list, see Why Upgrade to DVD Profiler Unlimited. "OH MY GOD! Thank you so much for DVD Profiler! From: Dennis L, the most satisfied customer on earth"
DVD Profiler can manage any size collection. Extensive data collection, filtering and reporting features specific to DVD, and unique to DVD Profiler. Put simply, DVD Profiler is the best way to track your DVD addiction! "Completely intuitive, quick and easy to use ...and has more features than I've figured out what to do with" - Simon T.
Just enter the UPC from the DVD case and DVD Profiler does the rest! If you have a DVD-ROM drive, its even easier. Put the DVD in the drive and let DVD Profiler recognize it automatically. Don't have the UPC yet? Add it by title using powerful search criteria. "With Dvd Profiler it took me only a 10th of the time to catalog my DVDs" - Marty G.
Extensive, powerful search and filter functions let you find what you're looking for fast. Or, browse your collection by actor or director through a filmography customized to your collection. DVD Profiler's complete and customizable reporting engine let's you take your collection from the computer to the coffee table in style. Check the downloads section for a huge repository of user-created reports. New! Scour the web for pictures of your favorite cast and crew to add to your local database. "We had our DVD's in a MS Access database, but really couldn't do much as far as custom reporting, not to say lack of images. You folks solved all these problems!" - John M.
Build a database of users who borrow (or just watch) your DVDs and track lendings and/or viewings. Monitor loan status, view and edit history by user or DVD, and generate reports to keep tabs on your collection. "My favorite use though is I no longer have to wonder which friends currently are borrowing my movies, I keep it all organized. Thanks again for this wonderful application." - P.C. Highly customizable interface. Store multiple layouts and switch at will. "The concept is brilliant, a must have for anyone who has a large collection of DVDs. I've been waiting for a good DVD inventory program for quite a while now but never envisioned something like this!"